Currently serving as a Senior Client Program Manager for CB&I Environmental & Infrastructure, Mr. Valdes is a professional engineer (“P.E.”) who worked for Miami-Dade County (“County”) for more than twenty years. Mr. Valdes worked as a division chief in both the County’s Water Management Division and Division of recovery and Mitigation until 2008. From 2008 to 2013, Mr. Valdes was an Assistant Port Director in the County’s Seaport Department, responsible for the entire Capital Improvements Program at Port Miami. Major projects included the PortMiami tunnel, on-dock rail restoration, dredging, two thousand meters of wharf strengthening to support thirteen gantry cranes, including four Super Post-Panamax Cranes, and various other projects. The total value of these combined projects is/was nearly US$2.0 billion. 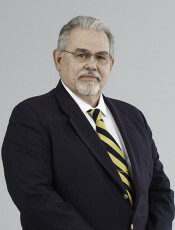 Prior to joining the County, Mr. Valdes worked in Venezuela in the fuel additive business. A graduate of the University of South Florida (Tampa, Florida), Mr. Valdes is fluent in Spanish, He enjoys travelling, golf, scuba diving and fishing.